So, I am sure you all read my first part of this post called "Deck the halls with...Wait, I have no halls", well this is the second installment to that. So, I felt that my deck was just missing something, but I could not think of what. So being a good american I decided to add more lights. Mind you that this is like a 35 sq ft area. 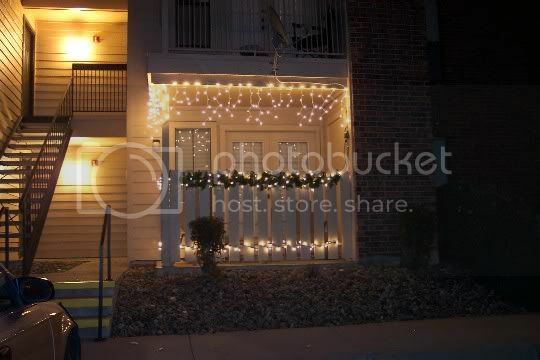 So, I am now up to 400 lights, which is my math is right, thats about 11.5 lights per sq ft. 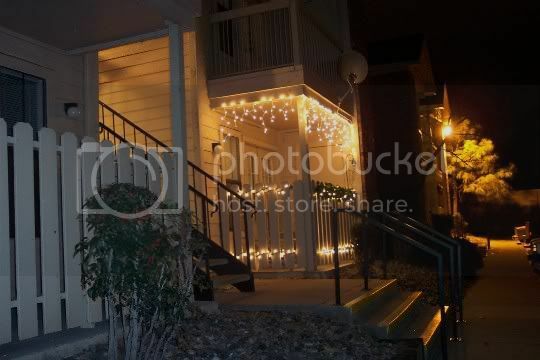 So, below are some pictures I took tonight of my deck with the new lights added. It looks really nice, Kevin! You for hire? Hehe. Just kidding. Thank you very much. I think it looks great also, that and I am the one that created it. lol. Also, normaly I would be for hire, but A) too late in the season, and B) I am booked all up doing other crap.